Glen Erin at Lancefield is the perfect location for a country wedding, conference or corporate retreat. This 4.5 star boutique accommodation is situated in the beautiful countryside of the Macedon Ranges of central Victoria and is only a 35 minute drive from Melbourne Airport and 50 minutes from Melbourne central business district. Your guests or delegates can relax in our luxury hotel style suites overlooking the picturesque vineyard and enjoy wine tasting at our cellar door, delicious meals in our fine dining restaurant or the comfort of one of our many function and conference rooms. Glen Erin provides facilities for catered functions and events from small intimate dinner parties to large cocktail functions and dining facilities in the Vineyard Room for up to 180 guests. An ideal conference venue, Glen Erin invites you and your delegates to experience our leading corporate retreats. 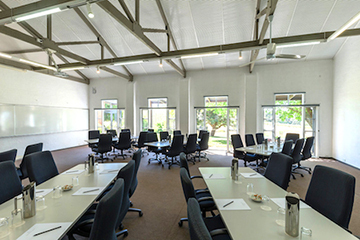 We offer facilities for meetings, conferences, corporate retreats, team building events and other work functions. In such a competitive business environment, they understand the positive impact a well planned and executed meeting or conference can have. They will work with you to understand your needs and to provide a corporate retreat that exceeds your expectations. If you are looking for a point of difference, Glen Erin is renowned for themed functions which will have your guests leaving with a truly memorable experience. Extensive menus are available for your selection and all inclusive packages can be tailored to your needs.